I announced I would see the artistic process through, wherever it leads. I scanned the terrain of the dominant order, a shadowy world, far from reality. I infiltrated the infiltrators. I saw fear and terror and control locked behind fences. I saw the raw outline of their barricades planted deep into our consciousness. Today, while on the third day of the SITUATIONAL TOURS, I was invited to visit the White House to photograph the grounds… inside the very belly of the beast. 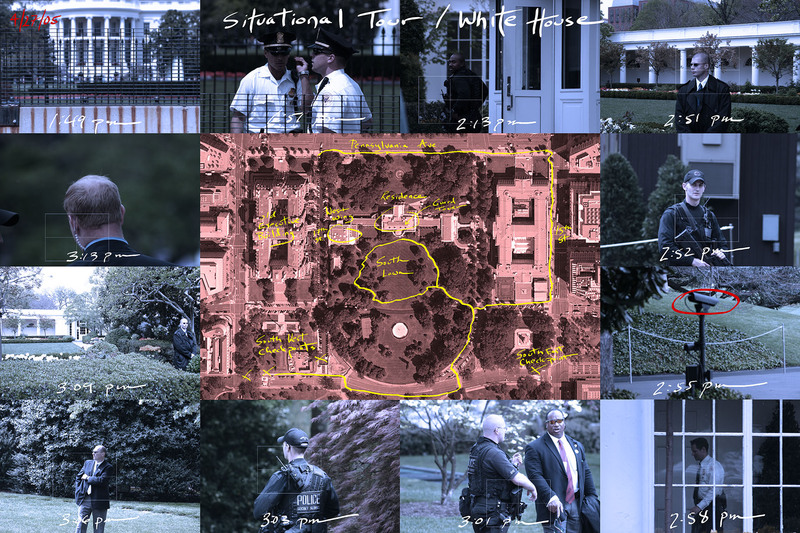 It was a picture of splendid beauty, springtime in Washington, and the frightening presence of Secret Service strapped with automatic rifles and an impressive array of mobile telemcommunications devices tucked neatly behind their ears. The Secretary-at-Large though, carried his own system, a Treo 650 smartphone uploading directly to the Season in Hell blog. This action was carried out multiple times right on the White House South Lawn amidst the most sophisticated surveillance system in the world.